Microsoft on Tuesday released 14 security updates, including fixes for the Spectre and Meltdown flaws detailed last week, as well as a zero-day vulnerability in Microsoft Office that is being exploited in the wild. Separately, Adobe pushed a security update to its Flash Player software. Last week’s story, Scary Chip Flaws Raise Spectre of Meltdown, sought to explain the gravity of these two security flaws present in most modern computers, smartphones, tablets and mobile devices. The bugs are thought to be mainly exploitable in chips made by Intel and ARM, but researchers said it was possible they also could be leveraged to steal data from computers with chips made by AMD. By the time that story had published, Microsoft had already begun shipping an emergency update to address the flaws, but many readers complained that their PCs experienced the dreaded “blue screen of death” (BSOD) after applying the update. Microsoft warned that the BSOD problems were attributable to many antivirus programs not yet updating their software to play nice with the security updates. On Tuesday, Microsoft said it was suspending the patches for computers running AMD chipsets. “After investigating, Microsoft determined that some AMD chipsets do not conform to the documentation previously provided to Microsoft to develop the Windows operating system mitigations to protect against the chipset vulnerabilities known as Spectre and Meltdown,” the company said in a notice posted to its support site. In short, if you’re running Windows on a computer powered by an AMD, you’re not going to be offered the Spectre/Meltdown fixes for now. Not sure whether your computer has an Intel or AMD chip? 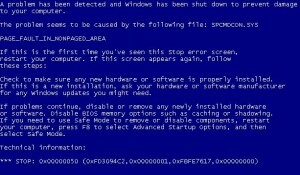 Most modern computers display this information (albeit very briefly) when the computer first starts up, before the Windows logo appears on the screen. Here’s another way. From within Windows, users can find this information by pressing the Windows key on the keyboard and the “Pause” key at the same time, which should open the System Properties feature. The chip maker will be displayed next to the “Processor:” listing on that page. Microsoft also on Tuesday provided more information about the potential performance impact on Windows computers after installing the Spectre/Meltdown updates. To summarize, Microsoft said Windows 7, 8.1 and 10 users on older chips (circa 2015 or older), as well as Windows server users on any silicon, are likely to notice a slowdown of their computer after applying this update. Any readers who experience a BSOD after applying January’s batch of updates may be able to get help from Microsoft’s site: Here are the corresponding help pages for Windows 7, Windows 8.1 and Windows 10 users. Microsoft confirmed today that the recent spate of Windows XP crashes and blue-screens experienced by people who installed this month’s batch of security updates were found mainly on systems that were already infected with a rootkit, a tool designed to hide malware infestations on host computers. 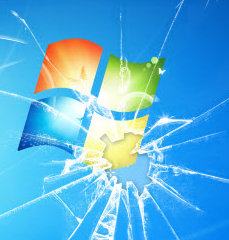 The folks at Redmond initially suspected rootkits may have played a part in the interminable reboot loops that many Windows users suffered from following February’s Patch Tuesday, but the company also said that it couldn’t rule out the possibility that third-party hardware and software conflicts might have also been to blame. Today, Microsoft rejected the latter possibility, and said it had concluded that the reboot occurs because the system is infected with malware, specifically the Alureon Rootkit.